At the beginning of each term, I give my critical thinking students a set of six cards. 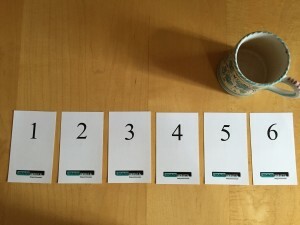 Each card has a number on it – one through six. (I also add my logo to do a little low-cost branding). Students bring the cards to each class. I use them to guide discussions about topics where there is no obvious right answer. I ask a question with up to six alternative answers. I then ask the students to select the “best” answers and — when I give a signal – to hold up the number that represents their choice. The trick is to do it simultaneously. Then I say something like, “Jamal, you’re holding up number six and Carmen is holding up number three. Let’s discuss why you’ve chosen different answers.” This often leads to some very robust discussions. Nobody hides and everyone knows that they may be asked to explain their opinion. If you mix in a little humor, it can also be a lot of fun. I call these equal opportunity discussions. In most discussions, I find that whoever speaks first exerts undue influence on every subsequent speaker. It’s a phenomenon called social convergence and it’s impossible to eliminate unless you have everyone “speak” simultaneously. With simultaneous responses, everyone has an equal opportunity to get their idea across. I first used this system during the merger of Lawson, an American software company, and Intentia, a Swedish software company. Both companies had about 2,000 employees. They also had different national traditions and corporate cultures. Every employee had an opinion about what the new company culture should be. The question for managers (including me) was: how do we gather, weigh, and merge these opinions? We decided to use equal opportunity discussions focused on how the new culture would respond to different behaviors. For instance, in a meeting with up to a dozen employees, we might ask a simple question: “Klaus is always late to staff meetings. In our new company culture, what do you think Klaus’ manager should do?” We included a list of up to six answers. We asked the employees to consider the answers and then hold up her or his chosen answer simultaneously. This produced some very spirited discussions. We kept track of how different groups answered each question. Did marketers answer the questions differently than, say, engineers? How about executives versus individual contributors? It took time but it was very valuable information that ultimately led to a coherent new culture. A similar technique works well in promoting innovation. The first step is to gather a wide range of diverse ideas. Letting one person speak first (especially the boss) will reduce diversity. When I ran staff meetings focused on creating new ideas, I would frame up the issues several days in advance. I asked each participant to consider the issue and develop his or her best ideas. I then asked them to write down their ideas – no more than a paragraph or two. When we got to the meeting, I asked everyone to push their written descriptions to the middle of the table. I then gathered them up, shuffled them a bit, and started the discussion. I thought about these processes when I spotted a recent article in Harvard Business Review titled, “People Offer Better Ideas When They Can’t See What Others Suggest.” The context is slightly different – the authors are looking at programs like Dell’s Idea Storm site or the My Starbucks Idea site. I’m sure the anti-clustering software is more sophisticated than my cards. But if you want to get off to a quick start, the cards work pretty well. Just make sure that every idea has an equal opportunity to “win”.